Your daily routine is defined socially – so why should I appeal to you as an individual? Posted by Oliver Payne | Don’t mess with Texas · George Marshall · New normal · Polar Bears · Psychology · R. Buckminster Fuller · Routine | The Hunter Blog | 1 Comment on Your daily routine is defined socially – so why should I appeal to you as an individual? [tweetmeme] You are wonderful. Your friends and family – I’m sure – would say you’re an individual. Unique, even. Except you’re not. You’re a routine: One that’s shaped by your definitions of normal practice. A normal practice that’s defined by those around you. In order to change your behaviour, I need to challenge your definitions of normal practice by influencing those around you. Why would I want to change your behaviour? For the good of the community – like Texas and its highway litter campaign. Texas’ researchers found the main source of highway litter came from males under 35 years old who drove pick-up trucks, and liked sports and country music. Fines didn’t work, so they recruited Texas’s sporting and country-music heroes, from Lance Armstrong and Chuck Norris to Willie Nelson and Lyle Lovett to front a campaign. One advert had a famous pitcher hurl rubbish in a bin using his famed split-fingered technique, followed by the catchphrase, “Don’t mess with Texas”. The ads avoided the negatives of guilt and shame in favour of the positives of pride and group identity. A ‘new normal’ was established. Within five years roadside litter was down by over 70%. The campaign had targeted a specific group with a message from “people-like-them” that they were willing to hear. Clearly the toe-to-toe fight to change behaviour through fines didn’t work – whereas simply pretending like everyone else’s behaviour was different, did. As the architect Buckminster Fuller said, you don’t change things by fighting the existing reality, you change things by building a new model that makes the existing one obsolete. Embedded in the routines of everyday life are the patterns of demand for energy, water, and other resources: Change these routines, and we change the patterns of demand. And if we change patterns of demand to reflect a more sustainable way of living, we change the planet: A ‘new normal’ that benefits us all. Shamefully, current green versions of ‘Don’t Mess With Texas’ seem to revolve around saving polar bears and living in tents: It’s neither desirable, nor about people you know and love. However, building a new model of normal practice to deliver a carbon-free world could easily represent new energy provision, energy independence, and the potential for new enterprise: Both desirable, and supportive of those you know and love. 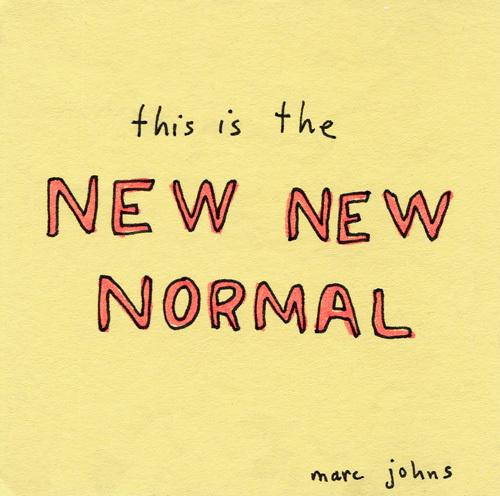 This ‘new normal’ would stimulate the innovation needed to deliver against our need to reduce or replace our embedded carbon-rich energy and water needs: A new model of normal practice indeed.